On the eve of Mike Pompeo's Thursday confirmation hearing to be Secretary of State, a number of his most prominent backers are making their support for him public. Thirty former government officials with national security experience have written a letter to the top Republican and Democratic members of the Senate Foreign Relations committee, Sens. Bob Corker and Bob Menendez, endorsing the current CIA Director and former Kansas Congressman. The authors cite the "hot wars" in Syria and Afghanistan, emerging crises in Iran and North Korea, as well as humanitarian disasters in Venezuela and across Africa, arguing that Pompeo is the right man to confront those challenges. "In every single one of these areas, strong American leadership is critical," they explain. "We believe that Director Pompeo is a strong choice to lead the Department of State at a time of great uncertainty in the world, where robust leadership from the Department and our nation is needed." The list of signatories includes Keith Alexander, who served as the director of the National Security Agency (NSA) under President George W. Bush and President Obama, former NSA and CIA chief Michael Hayden, and former attorney general Michael B. Mukasey. It was organized by two congressional staffers that worked closely with Pompeo on the hill. The former officials note the decreasing power of the State Department and the need to revive its relevance in Washington. Under former Secretary of State Rex Tillerson, many career officials felt that their expertise were not valued. They also criticized how he stood by the Trump administration's proposal to cut the State Department budget by 30 percent. "We all firmly believe the Department of State plays a crucial role in the national security process and that Mike is in a unique position to bring the Department back to a place where it can play its historically central role in this process," the letter states. "We have no doubt that if confirmed, Mike would work diligently to restore the Department of State to its rightful place and would serve with honor and distinction as he has in his previous service for our nation." 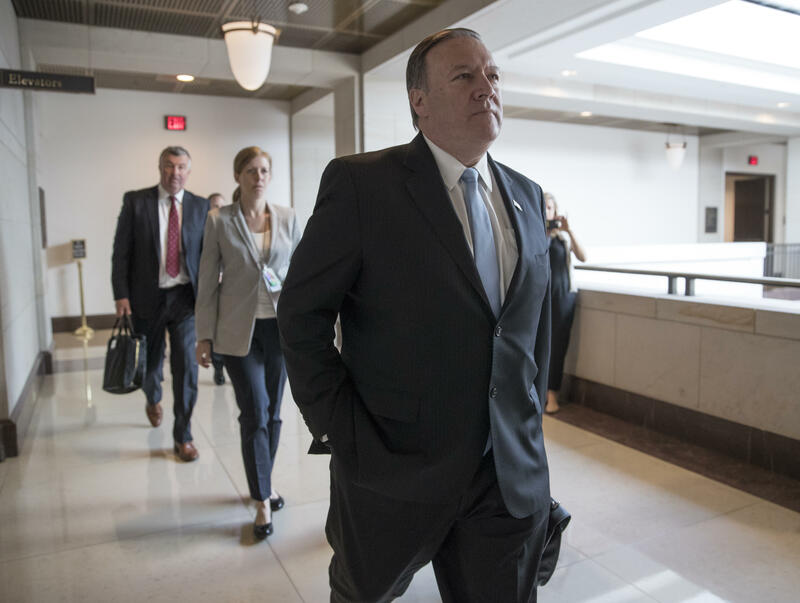 Those who have been helping Pompeo prepare for the hearing say that he is committed to standing before the committee and pledging his devotion to reinvigorating the department's role in American diplomacy. Former secretaries of state, including Hillary Clinton, expressed concern about the low morale at the department when they spoke with Pompeo ahead of his hearing. Citing the "anxious workforce" that Pompeo faced at the CIA when he arrived, the letter writers say that Pompeo was able to take their pulse and energize the agency. CIA analysts back up the letter's sentiments, citing the way in which Pompeo relied heavily on others' expertise and did not come into the agency with a large team that isolated him from the people who knew the issues best. Observers inside and outside the intelligence community say the State Department will be a better fit for Pompeo to advocate for the policies he feels strongly about. Pompeo was nominated as the CIA director in a bipartisan vote, with 66 senators voting in his favor. Yet he is expected to face a tougher battle in Thursday's hearing. Two Democrats on the Senate Foreign Relations Committee, who both voted to confirm Pompeo as CIA director, have not yet decided if they will side with him again. They say this is because the two jobs are very different and worry about Pompeo taking an overly secretive approach to the role as America's top diplomat. CBS News' Olivia Victoria Gazis contributed to this story.